If a man whitens his hair, his beard, his lips and his eyebrows, and, were it possible, his eyes, even those who see him daily would have trouble recognizing him. By the time Bernini created the pope’s tomb, he had many times portrayed the pope, who was a friend as well as his most powerful patron. The challenges of animating a marble bust were magnified in this case by the fact that the sitter, Monsignor Francesco Barberini (1528–1600), had died more than 20 years before Bernini set to work. The monsignor was a learned man, serving in several positions within the church. He became an influential mentor to his nephew, Maffeo Barberini, the future Pope Urban VIII. After Maffeo’s father died when the boy was only three years old, Francesco had taken him under his care and guided his career. 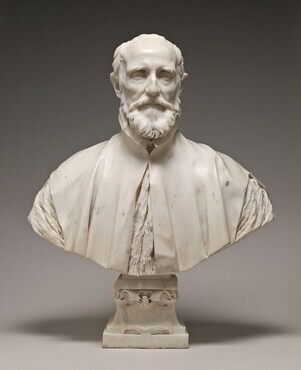 Before his election as pope in 1623, Maffeo commissioned Bernini to create several busts to honor family members, including this one of his revered uncle. The intricately carved bee that appears on the socle is the family’s symbol. Bernini’s portrait busts are among the most brilliant ever made. When Bernini had a living subject before him, he preferred that the sitter talk and even walk around. It helped the artists to animate his sculptures, physically and psychologically. In the case of Francesco Barberini, the fact that his portrait was carved posthumously may explain a certain remoteness that is uncharacteristic in Bernini’s work. Bernini probably based the portrait of Francesco on a painting. Beyond the facial resemblance, details of the monsignor’s dress are identical in both the painting and the sculpture. The breadth of the chest, which is considerably larger than those that Bernini normally carved at this time, suggests the bulk of the seated figure in the painting. Bernini’s genius in carving is revealed in the intricate treatment of the shirt, deeply undercut collar, and pleated vestment with its zigzag patterns. Gian Lorenzo Bernini was born in Naples but spent most of his adult life in Rome, the appearance of which he transformed with large-scale architectural projects and spectacular fountains. His career was long and prodigious. Perhaps as early as age ten, he was active in the workshop of his father Pietro, who was himself a highly gifted and successful sculptor. Within a few short years Gian Lorenzo had become Europe’s foremost artist and remained so until his death at 82. He was not only a sculptor but was also a painter and draftsman, a leading architect, a playwright, and an impresario who organized spectacles and performances for the papal court. His talent, energy, and dynamic personality left an indelible mark on 17th-century culture, and his exuberant style came to embody the baroque age. Almost every traveler to Rome has seen his work: the ecstatic face of his sculpture of Saint Teresa in Santa Maria della Vittoria; the towering baldachin with twisted columns that rise above the altar inside Saint Peter’s Basilica; the enormous colonnaded plaza that lies before it; and the fountains that animate the Piazza Barberini and the Piazza Navona. Bernini’s first important patron was Cardinal Scipione Borghese, who commissioned the artist, still in his early 20s, for four large sculptural groups. Their dazzling technique (achieved in part by gifted assistants) and innovative narrative approach established the artist’s international reputation. In Maffeo Barberini, who became Pope Urban VIII 1623, Bernini found an engaged patron, with funds to match his ambition. Urban shared Bernini’s literary and intellectual ambitions as well as his artistic ones, and his patronage would sustain the artist until the pope’s death in 1644. After Urban VIII appointed Bernini to supervise the work at Saint Peter’s, Bernini became the virtual artistic director of Rome. His designs for the urban plan of Rome dramatically altered significant sections of the city. Aided by large teams of artists and skilled artisans, Bernini conceived ambitious sculptural projects as well. When Urban VIII died, Bernini’s fortunes declined. Too closely allied to the unpopular pontiff, Bernini was excluded from new papal commissions and took on private ones, including the Cornaro chapel in the church of Santa Maria della Vittoria, where the renowned sculpture of Saint Teresa is located. Some scholars have called Bernini’s bust of the French king the greatest baroque portrait sculpture. Then Urban’s successor, Innocent X, was lured unwittingly into seeing Bernini’s design for the Four Rivers fountain in the Piazza Navona, and he could not resist it. The sculptor returned to favor, although he never again enjoyed the level of papal support he had known previously. In 1665 Louis XIV invited Bernini to France. The description of his time there, recorded by Paul Fréart de Chantelou (1609–1695), is one of the most significant documents pertaining to his career. Despite the high expectations for his success in a foreign country, Bernini’s dynamic, individualistic style clashed with Louis’ formalized French academic system. Although Bernini’s plans for the Louvre were rejected, he created a magnificent marble portrait of the king. Back in Rome, Bernini continued working until his death in 1680.